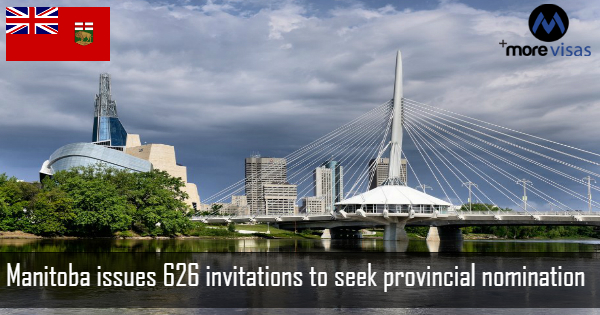 In the draw, held on May 11 Manitoba has issued 626 Letters of Advice to candidates seeking a provincial nomination in the Expression of Interest. It issued LAA to 267 candidates under the Skilled Workers in Manitoba Stream.The lowest ranked candidate receiving the invitation had a score of 500. The Program also issued 109 Letters to candidates in the Skilled Worker Overseas Stream. The norm for such candidates was that they offer a proof of having a close relative living in Manitoba. An additional norm is past education or work experience in the province and meeting additional criteria for the Provincial stream. Furthermore, 99 Letters were issued in the Strategic Recruitment Initiative Skilled Worker Overseas Stream. This Initiative features recruitment missions, in which the representatives of province interview overseas skilled workers and then issue Letters to persons who meet the eligibility criteria of the Provincial Nominee Program. There is a requirement to first submit an Expression of Interest to the Provincial Nominee Program to get a consideration. Moreover the Program will invite people who have already taken a pre-approved Exploratory Visit and had also passed the interview taken by a program official. MPNP issued LAAs in sub-stream linked to Express Entry- 151 to the new Express Entry candidates. The least-ranked candidate here had the EOI score of 562. Additionally, such candidates whose application for nomination in the province is successful get 600 more points in their total CRS score. The Program also holds periodic draws that are based on the Expression of Interest system where potential candidates express their intention to the province. Furthermore their profiles get a score on the answers they give in the online system. The top scoring candidates from the pool get a Letter of Advice to apply seeking provincial nomination from the Manitoba Government. Again, all local and foreign skilled workers who receive the LAA in this draw, and who have applied for provincial nomination successfully, must apply to the federal government and seek permanent resident status.